Tinkertown Museum in Sandia Park, NM. A tiny wooden skeleton at Tinkertown Museum. It’s hard to describe the world that Ross Ward, who once worked as a carnival backdrop painter, carved out for you, but we’ll try. Ward, who traveled with the circus for more than three decades, has been making miniature carvings out of wood since he was a youngster. He has since parlayed that pastime into a 22-room museum filled with massive murals and the most awe-inspiring wooden wonders, and it’s all in Ward’s own backyard. It took Ward over four decades to fill his museum with treasures, but it’s a product that was well worth the wait. Over 50,000 glass bottles form the ramshackle walls surrounding the museum, and everywhere you look, there are wagon wheels and old store fronts. And that’s just the exterior. 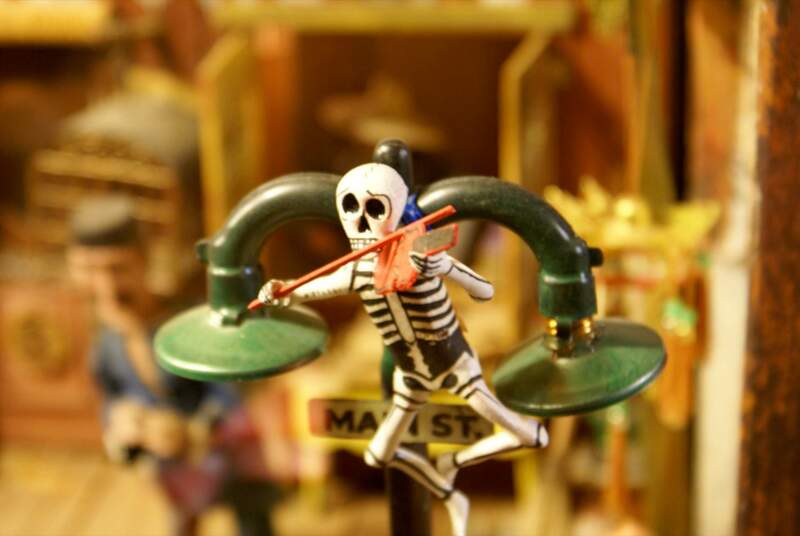 Inside the museum’s 22 rooms, you’ll find just about anything, from the miniature figures Ward took on the road as a traveling exhibit in the ’60s and ’70s, to Otto the one-man band and Esmerelda the fortune teller, both of whom will play you a tune or tell you a fortune for a quarter. You’ll also find a 35-foot antique wooden sailboat and dozens and dozens of wooden couples for wedding cakes. Sound surreal? That’s cause it is. We told you it would be hard to describe! It’s a wooden, antique carnival creation from Ward’s mind, and while it may sound like a mish-mash of mediums, it all works together in a way that only Ward could create. 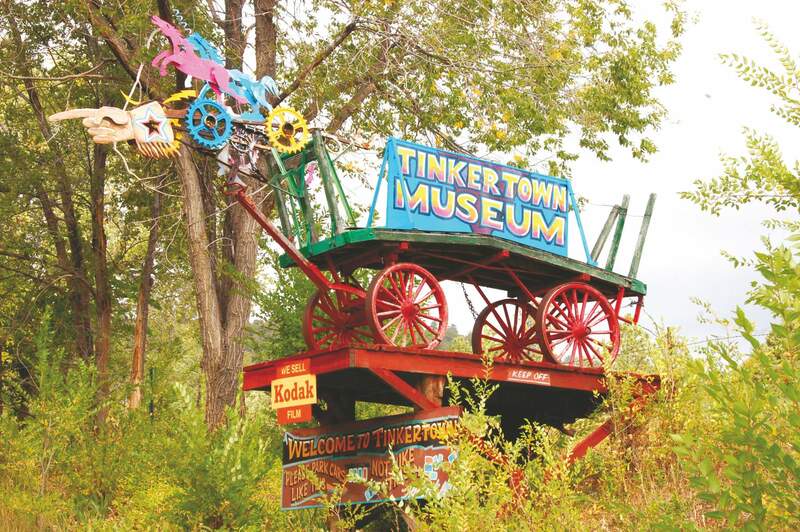 Ward has long since passed, but his family has kept Tinkertown, and the tinker’s vision, alive with the museum and those tiny little trinkets. And you, dear friends, should check it out, because we certainly did not do it justice with our description. So maybe plan to get outta town and over to Sandia Park, New Mexico. Cause that’s where the magic happens.